Many times you may be in a situation where your performance needs to be amplified to be heard. Today it is easier than ever to amplify your harp and get a good reproduction of the sound of your instrument. You can decide to have a very simple set-up, appropriate for many performance environments, or a more complex set-up which will allow you the greatest amount of flexibility. For an explanation even more detailed than the one below, feel free to hop on over to our Rees Concert Line site to the Amplifying Your Harp page. Our Pro Pickup, which is available as an option, combines a pickup, preamp, automatic adjusting EQ and Compressor into a single system which is internally mounted in the harp. ...because you have enough to worry about on performance days. (Shown below) The pickup is the long solid bar at the top of the photo. The preamp is part of the quarter-inch jack housed in the long tube. This is all connected to a volume control wheel and a 9v battery attachment used to power the preamp. A microphone will give you the best sound production if you (1) purchase the highest quality mic, (2) have it operated by an experienced sound technician who is specifically experienced with harp amplification and (3) the sound technician is operating a good quality mixer. If you don't have someone like that following you around then forget the microphone for your harp. Even if you try to set-up a mic yourself, in advance, you are inviting feedback squeals, exterior room noises and overall poor amplification. 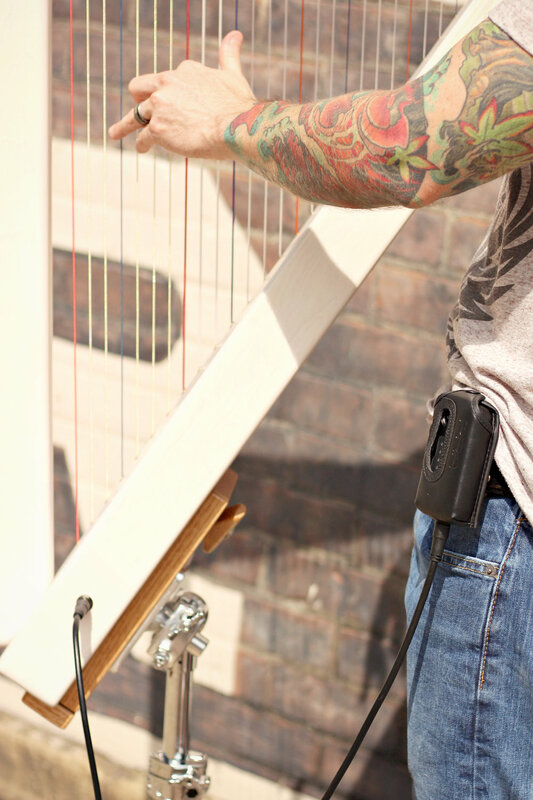 Basically, you want to have the sound for your harp under your control as much as possible so we always recommend that harp pros use a pickup and, preferably one with a built-in preamp. In those rare instances when you have a professional sound technician at your service then you can rest easy, the rest of the time you will have things under control for yourself. Whew! Cables connect everything to everything else and yet this critical component is ignored by most musicians. A quality cable is very important and you can easily hear the difference between a high definition cable and an economy cable. Buying an economy cable is like settling for a terrible Wifi signal. Having a fast computer doesn't matter if the WiFi is slow. If you have a quality harp and pickup system you want to make sure that your amp gets to hear that quality and pass it on to your audience. We recommend and carry the famous Asterope cables which are widely acknowledged to be the best in the industry. You can find several different lengths here. A preamp is a device that strengthens the signal coming from your harp. It is powered by a battery. This stronger signal will assure that more of the full sound of your harp will ultimately reach the amp. A preamp is not a necessity but it will provide a noticeable improvement in performance. 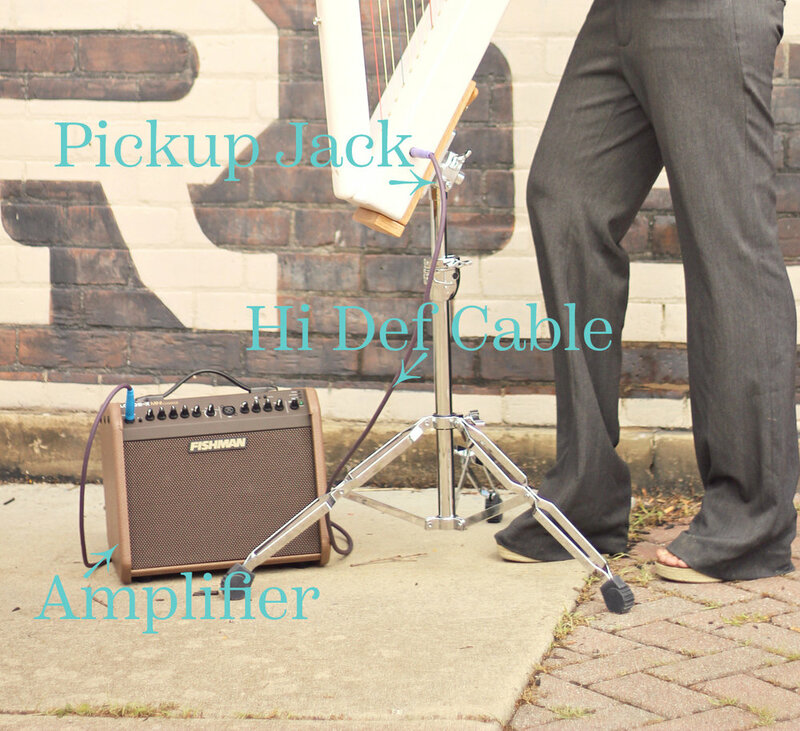 You can have an internal preamp, which is wired inside your harp just before the jack, or you can purchase an external preamp that rests on the floor. If the latter and to simplifiy things, we generally recommend that you purchase a preamp that has an equalizer built in. Connect the preamp/EQ to your harp with a short cable (3 ft/.9m or less). A short cable loses less signal and you get better results. Another important thing to know about amps is that not all amplifiers are created equal when it comes to harps, most are made to optimize guitars, basses or electronic keyboards. Some of these are really wonderful with harps and some are aren't. We carry a number of amps we feel we can confidently recommend, see our Amplification page for a selection of the ones we like best.